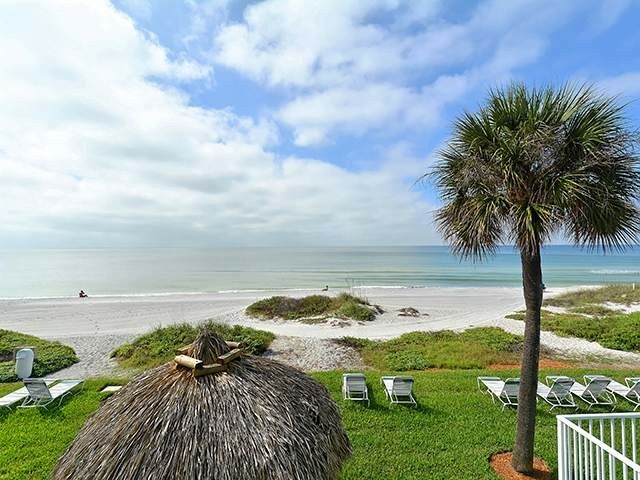 This second floor one bedroom is in a great location directly on the beach with a spectacular view of the Gulf of Mexico and a tiki hut just outside. This condo has the charm of "Old Florida" with modern amenities. This unit has new windows and door with wicker furniture, wicker ceiling fans, new furniture in the living area including a queen size pull-out sofa in the living room and two recliners. There is a king sized bed with a pillow top mattress in the bedroom. There is LED lighting throughout with USB charging ports located in three locations for charging your cell phones and tablet devices with two HD flat screen TVs. A Blu-ray DVD player in the living area, a HDMI cable for attaching your gaming stations directly to the HDTV and free Wi Fi is provided for your enjoyment. The kitchen and bath have new cabinets with soft close cabinet doors and drawers, quartz countertops, decorative glass backsplash in the kitchen and new floor tile and fixtures. The kitchen is fully equipped for all of your culinary needs with new small appliances, utensils, cooking and baking pans and a new Whirlpool glass top range with a double oven, over the stove microwave, a double door refrigerator with a pullout freezer, an ice maker and a dishwasher. The bathroom has a tub/shower combination and the walk in closet has built in custom shelving with a digital safe large enough to house up to a 17" laptop. A hair dryer, ironing board, steam iron and two beach chairs with an umbrella are included for your enjoyment. Great restaurants, fishing and of course the shops at St. Armand's are only minutes away. Swim in the gulf or the heated pool, walk on the beach, relax on the lounge chairs, eat under the tiki huts or enjoy the sunsets. However the best part is that the beach is just steps away and the view from the large picture window is spectacular.